To secure the license for what was, at the time, the most expensive show on TV must have incited much excitable palm rubbing from the execs at MultiToys Corp. 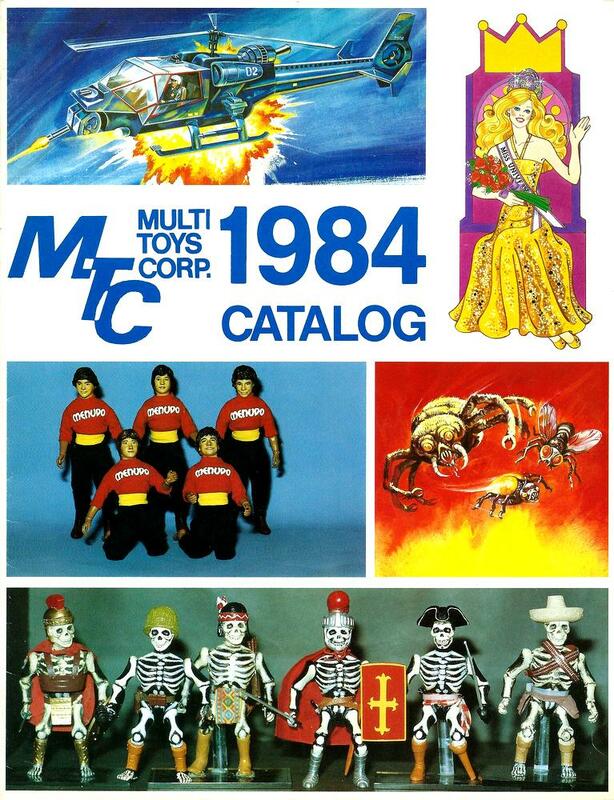 Announced amongst what could only be described as an eclectic line of action figures, playsets and dolls (from the Bugmen of Insecta to The Love Boat) and showcased as hastily produced mockups (some represented only by artwork) the MTC 1984 catalog is a glorious rare-as-you-like piece of nostalgia and insight into the toy industry. 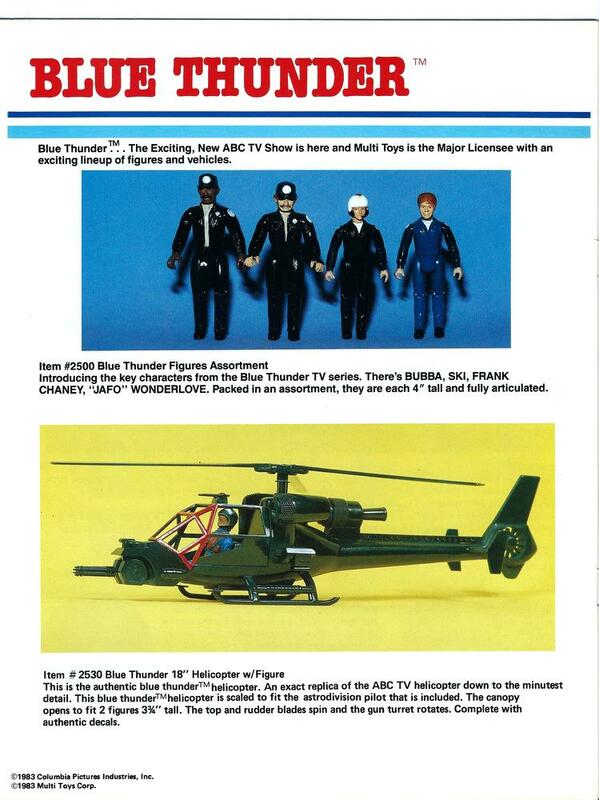 Of particular interest, however, were the company’s ambitious plans for ABC’s Blue Thunder, where you may be both surprised to learn the extent of the line and saddened by how little of it actually made production – From the top we see the whole main cast of the Blue Thunder TV show represented as articulated 4″ scale figures (even correctly scaling Bubba and Ski) intended for interaction with the Blue thunder Helicopter, Rolling Thunder van and Blue Thunder Jeep. Only the Blue Thunder Helicopter would survive the cull and be sold complete with what is described as an ‘Astro Division’ pilot (even in this scale easily identifiable as Roy Scheider) as, sadly, the other figures & vehicles were never made. 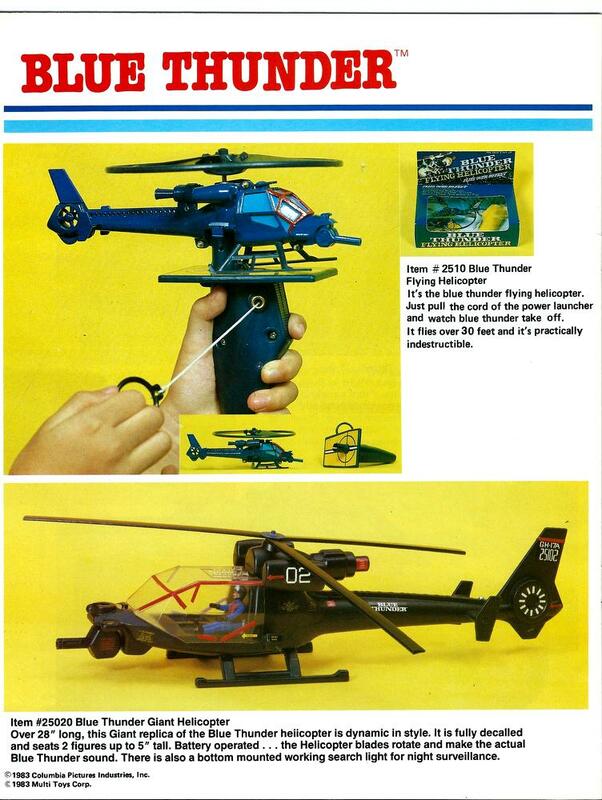 The items on the following page, however, were also successfully marketed with the Flying Blue Thunder (featuring great box art) and battery operated Blue Thunder Giant Helicopter eventually becoming the most rare and sought-after toys associated with the subject. Coming in at a whopping 28″ long with sound effects and lights, this toy (though hardly the most accurate rendition of the helicopter) in its complete form commands an appropriate sum to obtain today if you can find one at all. This entry was posted in The Merchandise by airbuster02. Bookmark the permalink. I just discovered this site (via RPF) and read the whole thing. Very cool! I have contributed to Andrew’s and Greg’s sites; I hope to do the same here. 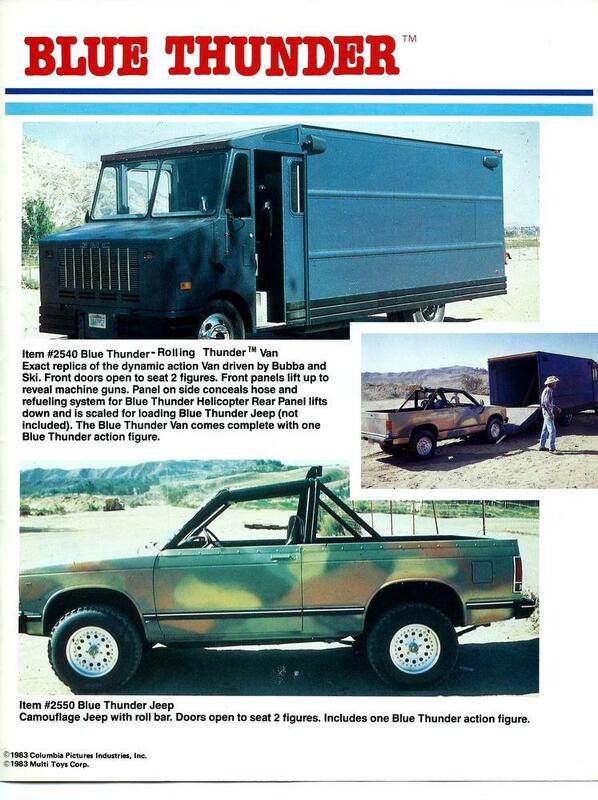 I just posted about the Kitech Blue Thunder over at the RPF. Awful kit, but a nice way to spread the love to the next generation. I was always under the impression the Kitech kit was a poor recast of the Monogram release which would account for its poor quality. I saw your thread on the RPF and I’m suitably amazed at what you managed to do with it. Look forward to anything you can contribute and hope you continue to enjoy..!